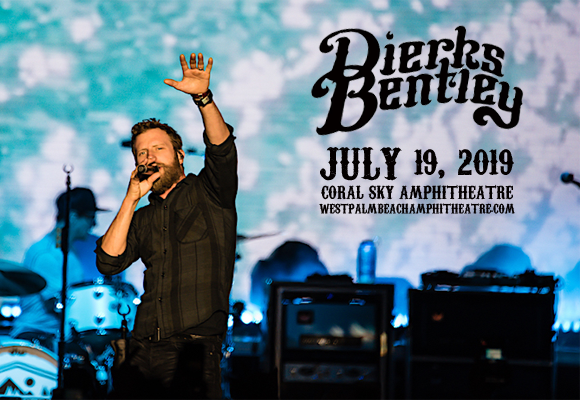 Announced with a hilarious figure skating parody video (which sees some serious moves from its star), Dierks Bentley's Burning Man Tour comes to Coral Sky Amphitheatre on Friday 19th July 2019! Unfortunately, we may not get to see the singer "On Ice", but we will see him performing an electrifying headline set, and in addition there'll be the incredible Jon Pardi & Tenille Townes in support! “You’ve heard the hits, you’ve seen the spectacle…” – get your tickets now! Signed to Capitol Nashville in 2012, country music singer and songwriter Dierks Bentley was a instant hit with his 2013 self-titled debut album, which peaked at number four on the Billboard Top Country Albums chart and number 26 on the Billboard 200, and was certified platinum by the RIAA, after selling over one million copies. His success continued with 16 number-one singles and six top five hits on the Hot Country Songs and Country Airplay charts over the years, as well as 14 Grammy Award nominations. Bentley has also released nine studio albums (including 2010's Up On the Ridge, which issued his usual country rock sound for a vintage bluegrass feel) and a greatest hits compilation album – Greatest Hits/Every Mile a Memory 2003–2008. 2018's The Mountain is his most recent album.